Although isolated from the main forest and surrounded by private property, at 200Ha ‘The Pollack’ wetland forms part of the Koondrook State Forest and is included in the internationally recognised Central Murray Ramsar site. 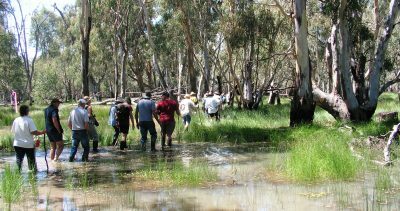 A wetland walk was held on Feb 14 2017 to provide members of the local Barham community a chance to see the outcomes of the environmental water that had been delivered to the site and also to celebrate World Wetlands Day. 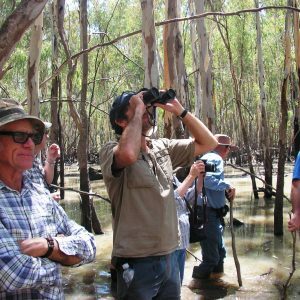 Over 20 community members donned gumboots and ventured out into the wetland to experience this amazing place and view the large range of colonial waterbirds that had nested and fledged chicks at the site for the first time in over 20 years. Environmental water has been used to extend the recession of the recent flood and help ensure a successful bird breeding event. Birds identified included Nankeen Night Herons, Pacific Herons, Intermediate Egrets and Cormorants amongst others. The delivery of environmental water into this wetland is dependent upon the support of surrounding landholders and is a great example of community and agency cooperation to achieve environmental outcomes. An excellent day was had by all and special thanks go to Tanya and Graham Heffer, and Dan Hutton and Emma Wilson. 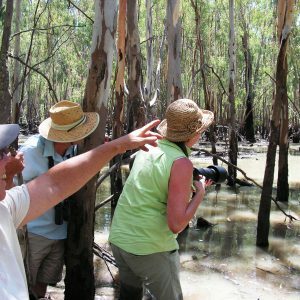 The wetland walk was supported by Murray Local Land Services with funding from the National Landcare Programme and undertaken with the assistance of NSW Forestry Corporation.